The unique properties and functionalities of chalcogenide glasses make them promising materials for photonic applications. Chalcogenide glasses are transparent from the visible to the near infrared region and can be moulded into lenses or drawn into fibres. They have useful commercial applications as components for lenses for infrared cameras, and chalcogenide glass fibres and optical components are used in waveguides for use with lasers, for optical switching, chemical and temperature sensing and phase change memories. Chalcogenide glasses comprehensively reviews the latest technological advances in this field and the industrial applications of the technology. Part one outlines the preparation methods and properties of chalcogenide glasses, including the thermal properties, structure, and optical properties, before going on to discuss mean coordination and topological constraints in chalcogenide network glasses, and the photo-induced phenomena in chalcogenide glasses. This section also covers the ionic conductivity and physical aging of chalcogenide glasses, deposition techniques for chalcogenide thin films, and transparent chalcogenide glass-ceramics. Part two explores the applications of chalcogenide glasses. Topics discussed include rare-earth-doped chalcogenide glass for lasers and amplifiers, the applications of chalcogenide glasses for infrared sensing, microstructured optical fibres for infrared applications, and chalcogenide glass waveguide devices for all-optical signal processing. This section also discusses the control of light on the nanoscale with chalcogenide thin films, chalcogenide glass resists for lithography, and chalcogenide for phase change optical and electrical memories. The book concludes with an overview of chalcogenide glasses as electrolytes for batteries. 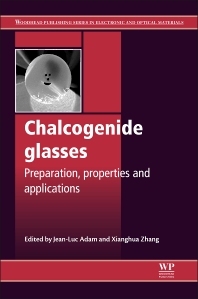 Chalcogenide glasses comprehensively reviews the latest technological advances and applications of chalcogenide glasses, and is an essential text for academics, materials scientists and electrical engineers working in the photonics and optoelectronics industry. Outlines preparation methods and properties, and explores applications of chalcogenide glasses. Dr Jean-Luc Adam is Director of Research at Centre National de la Recherche Scientifique (CNRS) and Director of the Institut des Sciences Chimiques de Rennes, France. Dr Xianghua Zhang is a Director of Research at Centre National de la Recherche Scientifique (CNRS) -Université de Rennes 1, France.